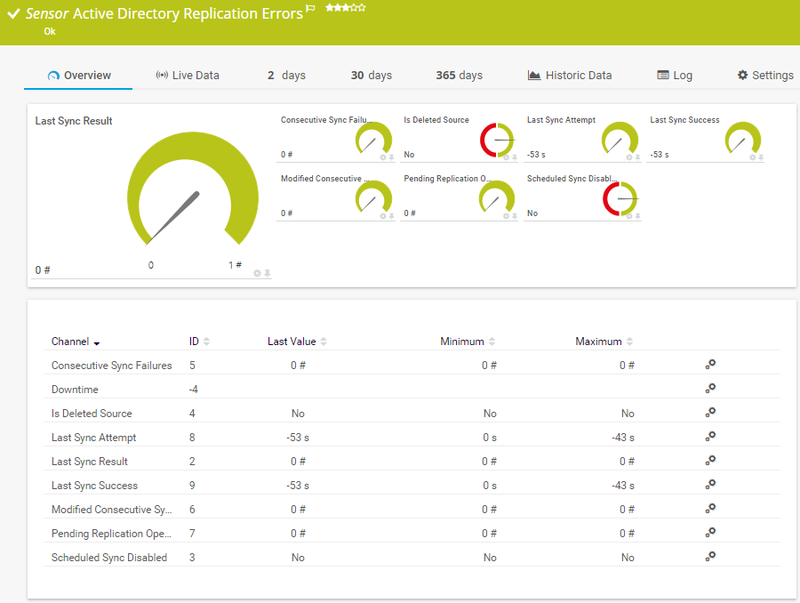 The Active Directory Replication Errors sensor uses the Windows credentials of its parent device to check domain controllers for replication errors. Requires valid Windows domain credentials in the settings of the parent device. Requires the probe system to be part of the domain whose AD you monitor. This sensor only works if the computer running the PRTG probe is part of the domain whose Active Directory you want to monitor. The probe runs either on the local system (on every node, if on a cluster probe), or on another system as remote probe. If this requirement is not met, the sensor will not work. Note: If you use local credentials, please make sure that the same Windows user accounts (with the same username and password) exist on both the system running the PRTG probe and the target computer. Otherwise the sensor cannot connect correctly. Select the replications you want to monitor. PRTG creates one sensor for each replication neighbor you choose in the Add Sensor dialog. The settings you choose in this dialog are valid for all of the sensors that are created. Select the replication neighbor whose replication you want to add a sensor for. You see a list with the names of all items which are available to monitor. Select the desired items by adding check marks in front of the respective lines. PRTG creates one sensor for each selection. You can also select and deselect all items by using the check box in the table head. Shows the replication neighbor whose replication this sensor monitors. Once a sensor is created, you cannot change this value. It is shown for reference purposes only. If you need to change this, please add the sensor anew.